Before removing the in-cabin microfilter cover, let the vehicle rest for at least 30 minutes. Check the exhaust pipes, muffler, and mounting components for incorrect attachment, leaks, cracks, damage, or deterioration. M/T OIL : Draining . Start engine and let it run to warm up transaxle. After refilling gear oil, check the oil level. Refer to MA-22, "M/T OIL : Inspection". If anything is found, repair or replace damaged parts and adjust CVT fluid level. Refer to MA-25, "CVT FLUID : Adjustment". Recommended CVT fluid and fluid capacity : Refer to TM-288, "General Specification". Use only recommended CVT fluid. Using transmission fluid other than recommended CVT fluid will damage the CVT, which is not covered by the warranty. Always use shop paper. Do not use shop cloth. Remove the drain plug and overflow tube and drain the CVT fluid from the oil pan. Refer to TM-266, "Exploded View". 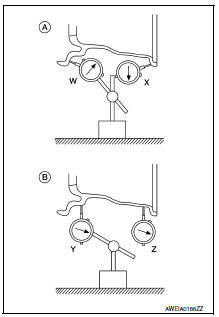 Fill approximately 3 liter (2-5/8 lmp qt) of the CVT fluid. 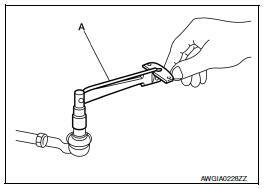 When the flow of CVT fluid slows to a drip, tighten the drain plug to the specified torque. Refer to TM-266, "Exploded View". Do not reuse drain plug gasket. Fill approximately 0.5 liter (1/2 lmp qt) of the CVT fluid. Check tires for wear and improper inflation. Check wheels for deformation, cracks and other damage. If deformed, remove wheel and check wheel runout. Remove tire from aluminum wheel and mount wheel on a balancer machine. Set dial indicator as shown. Check runout, if runout value exceeds the limit, replace aluminum wheel. Lateral Deflection (A) Refer to WT-54, "Road Wheel". Radial Deflection (B) Refer to WT-54, "Road Wheel". Remove tire from steel wheel and mount wheel on a balancer machine. Set two dial indicators as shown. Set each dial indicator to "0". Rotate wheel and check dial indicators at several points around the circumference of the wheel. Calculate runout at each point as shown below. Select maximum positive runout value and the maximum negative value. Add the two values to determine total runout. In case a positive or negative value is not available, use the maximum value (negative or positive) for total runout. If the total runout value exceeds the limit, replace steel wheel. Check brake fluid lines and parking brake cables for improper attachment, leaks, chafing, abrasions, deterioration, etc. Check using a scale if necessary. Be careful of vehicle speed because the brake does not operate firmly/securely until brake drum and brake lining are securely fitted. Make sure that the reading is within the following specified range using tool (a). Replace outer socket if the reading is outside the specification. 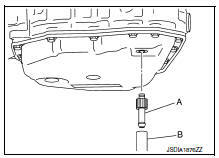 Tool number (a) : st3127s000 (j-25765-a) rotating torque : refer to st-19, "power steering gear". Apply an axial load of 490 n (50 kg, 111 lb.) To ball stud. Measuring the amount of stud movement using a dial gauge, make sure that the value is within specification. Replace outer socket (a) and inner socket (b) if the measured value is outside specification. Axial end play : refer to st-19, "power steering gear". Steering wheel play: Refer to ST-18, "Steering Wheel". 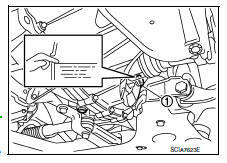 Check front and rear axle and suspension parts for excessive play, cracks, wear or other damage. Shake each wheel to check for excessive play. Check wheel bearings for smooth operation. Check axle and suspension nuts and bolts for looseness. Check strut (shock absorber) for oil leakage or other damage. 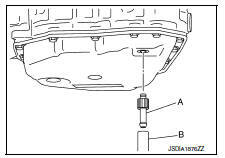 Check suspension ball joint for grease leakage and ball joint dust cover for cracks or other damage. After any collision, inspect all seat belt assemblies, including retractors and other attached hardware (i.E. Anchor bolt, guide rail set). Nissan recommends to replace all seat belt assemblies in use during a collision, unless not damaged and properly operating after minor collision. Also inspect seat belt assemblies not in use during a collision, and replace if damaged or improperly operating. Seat belt pre-tensioner should be replaced even if the seat belts are not in use during a frontal collision where the driver and passenger air bags are deployed. If any component of seat belt assembly is questionable, do not repair. Replace as seat belt assembly. If webbing is cut, frayed, or damaged, replace seat belt assembly. Do not oil tongue and buckle. Use only a genuine nissan seat belt assembly. For details, refer to sb-5, "inspection" in the sb section. Check anchors for loose mounting. Check function of buckles and tongues when buckled and released.